Mvuu Lodge, 'The Place of the Hippo', is tucked away along the meandering banks of the mighty Zambezi River. It is situated about 18 km from the Lower Zambezi National Park in the Chiawa Game Management area and right opposite Mana Pools. The wild animals roam casually through the camp providing you with a truly unforgettable experience. 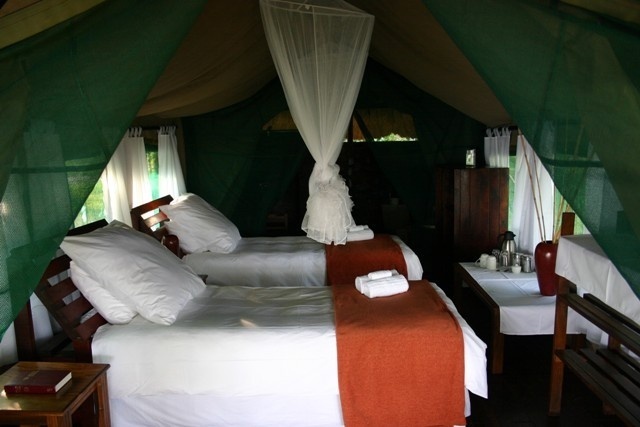 Mvuu Lodge offers luxury packages, self catering and camping. Enjoy a true Africa experience in our safari tents with en-suite bathrooms that overlook the mighty Zambezi River. The self-catering tents are fully equipped with linen, crockery, gas cooker and braai area. The campsites are situated in close proximity to the Lodge and are nestled in thick bush under a canopy of indigenous trees, providing a cool haven from the African Sun. All four campsites, Monkey, Mvuu, Elly and Leopard, have their own private hot shower, flush toilet and braai area. The ablution facilities are enclosed by stone walls and roofed by the majestic Zambian sky. Relax with a sundowner, great food & warm hospitality on our open aired dining deck looking out over the river. Finish off the day around a blazing bonfire in the boma while listening to the sounds of the African bush. Activities offered include canoeing, game viewing, river cruises, bird watching and fishing. (Aug-12). Approximately 18km from the Lower Zambezi National Park in the Chiawa Game Management area, you'll find tucked away in Zambia privately owned Mvuu Lodge. 'Place of the Hippo'. 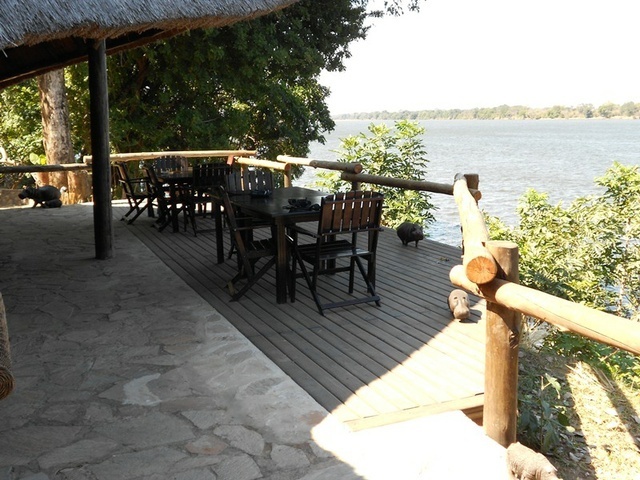 Situated on the lower part of the Zambezi River opposite Mana Pool. As you drive into Chirundu you will find a 'Chirundu Kaimon Bus Terminal' sign. Turn left at the second sign to go to the Pontoon. From Chirundu it is 11km to the Pontoon crossing (K56 000 for a local car $30 for foreign registered cars per crossing 06:00 - 18:00). Take the right-hand-road at the Y-fork just after the Pontoon crossing (See signs to Kayila) - then its just under 25km to Chiawa village - you turn right into the village and the road bends left out of the village. From Chiawa it's another 25km to Mvuu Lodge, if you ever think you may be going wrong, ask a local, they are friendly and helpful! Travelling from Lusaka, you can take the road via Leopards Hill and the first 50km or so from Lusaka is tarred. Further on the 4WD route to Mvuu Lodge is a lot of fun -real 4WD! (May-2014).